Philip Mead studied piano at the Royal Academy of Music, London, receiving numerous prizes and awards and a distinction in his final practical exam. 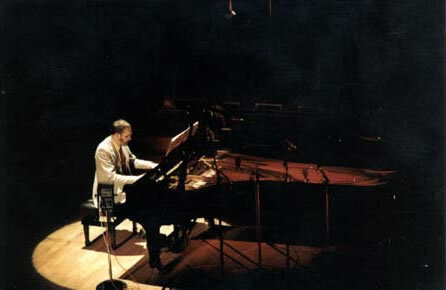 In addition to performing most of Messiaen’s piano music, including the first complete British performance of Catalogue d’oiseaux, he has premiered works by Crumb and Stockhausen and has commissioned many new works for piano, including Jonathan Harvey’s Tombeau de Messiaen (1994), now considered a contemporary classic. Mead is Founder and Director of the British Contemporary Piano Competition and was Head of the Contemporary Piano Department at the London College of Music to 2005. He is now a research Fellow at the University of Hertfordshire. [Xenia Pestova] How did you originally get interested in working with fixed media — what were the first piece(s) you discovered and played? [Philip Mead] I was doing a concert at the Purcell Room of Stockhausen’s Piano Pieces IX and X, and I wanted another more recent piece. I had just met Steve Montague (this would have been about 1980) and he suggested Strummin’ (1974–81), which was for piano and tape, and this was the first piece I played with electronics. You’ve worked with many important and influential composers since then on repertoire that you have commissioned, including Denis Smalley’s Piano Nets (1990–91). Can you tell us more about how the piece was written? I think it was a personal thing. He just wanted to write a piece for me. It was the fact that I was commissioning a lot of pieces at that time, and he wanted to add to it. In one of your articles, you mention that the piano is the timbral extension of the electronic sound in Piano Nets, and I was wondering what you mean by that — why is it that the piano is the extension, why not the other way around? It is that to start with, and as you get the decay of the opening sound, the piano colours it. Sometimes, however, the piano initiates the phrase, which is then taken up by the electronics. Thinking more about this timbral extension, what about the fact that the piano is limited timbrally, whereas in electroacoustic music we have access to an unlimited sound world — what do you think this means for the composer? That’s part of the charm, isn’t it? But I think that Smalley limits the electroacoustic sound as well, he does not use limitless possibilities. They are all of a certain type. So you could say that the composer limits the sounds he works with in order to create a structure? Yes, I think he deliberately limits what he works with to create some control. Otherwise there would be too many possibilities. He is very concerned with the structure, and that’s helped by a timbral uniformity. Speaking of timbre, what about chords as timbres — could one think of chord structures as “partials” within a timbre, do you think? Denis never mentioned that he was using them in that way. I think he is more instinctive in his composition than many people realise. For instance, he uses far less mathematical theory than Simon Emmerson does. The way Denis wanted me to shape the piano part was romantically, with exactly the same tonal gradations or phrases that you would get in romantic music. As an interpreter, how do you feel that this influenced your interaction with the electronic part? My interpretations tend to change, which is quite interesting. Originally, I did it with two sound projectionists, Denis Smalley, which tended to be more “classical”, and Steve Montague, which was a more “romantic” interpretation of the electronic part. That had a bearing on the way I played it, according to how the projectionist was doing it. Denis is very concerned with “performing” the electronic part, if you like. He is a world away from just putting on the tape and letting it run. He is doing all kinds of things with the levels to sculpt it to the acoustics of the room, to the piano. It was quite intimidating in some ways to work with him because he would listen to the sound, and then move the speakers maybe five inches, and you’d think he was having you on, but in fact he wasn’t. He has a very sensitive ear, and these minute changes can actually be crucial. So, my interpretation certainly did change according to who I played it with. Do you have any thoughts on the idea of movement of sound in space (when we diffuse the electronic part), and how that relates to the fact that the live instrument, the piano in this case, is a fixed sound source, which remains in one place? I think it’s exactly like playing a concerto. When you play with a big orchestra, sound comes from all directions. Let’s say you are doing the Grieg Piano Concerto — the second subject in the first movement is first played on the cellos and then the woodwinds — so, it comes from a completely different area. Do you think it is important for the performer to familiarise themselves with the theory of Smalley’s writings on spectromorphology? For me, the point is that I just wanted to play the piece. I worked with Denis for about three hours a week for nine weeks before the performance, when I played the piece by memory… I felt that I got it “from the horse’s mouth” that way. Did you ever discuss gestural relationships between the piano and the electronics? Denis mentioned this in the last movement, because it is climactic in a perfectly romantic sense, and everything is denser. The first version of the piano part did not have enough for the pianist to play to be as intense as the electronic part — there were not enough piano gestures due to the inescapable part that piano sound dies away, so the piano part was subsequently revised with a lot more material to give the pianist more gestures to match the electronic part. In general, you always told me that you start working on music with fixed media by learning the electronic part first, and then gradually adding important points of synchronisation in the piano part before “filling it in” completely. Would you elaborate further? The crucial piece for that approach was Papalotl (1987) by Javier Álvarez. It’s got microsecond synchronisations, and I came to the conclusion that it needed a particular way of learning, partly because the synchronisations were so quick and dense. So, I made up this way of learning whereby I simply cut the piece down to sync points, so maybe playing one chord in four bars, but then I would keep doing that by reflex until I knew the tape part so well that I would be able to do these absolutely spot-on. Then I gradually filled in the piano part. For instance, if there was a sync point with one chord, I would then add a couple of events before the chord, and so on. The problem is that what everyone does is that they would learn the piano part, and then at a later stage put it with the electronic part, and that doesn’t work, because you can’t change the fixed sounds! The method I used works better, and I continued to use it. Certainly with [Horacio] Vaggione’s music it is also very successful. Of course, it’s painful, and it is slower, you can’t quicken the process up, it has to go at its own speed, but it’s worth it. Having said that, there’s a caveat. This isn’t the end of the story. When I performed Papalotl, the most successful performances were not always the most accurate. In other words, it could be very accurate, but “dead”, or less accurate, but communicate musically. The point is, once you get these synchronisation points set, you are then in a sense playing the music “normally” — a bit faster or slower, but this is happening on a microsecond level rather than macro scale. So, if the sync points stay the same, it is the music in between that is changing, and no two performances are alike, as with any other piano music. It all came to an end after I commissioned Harvey’s Tombeau de Messiaen (in 1994). By then I had about 60 pieces of varying quality, and I felt that there was simply nothing more to be done with the fixed medium. So, Tombeau was deliberately the last piece, because I felt that I’d gone as far as I could, and the only thing that could happen after that would be repetition, which I wasn’t interested in. Quite interestingly, the next piece I commissioned was for brass and piano, which was a completely different area. When I eventually came back to [piano and electronics], it was Rob Godman’s piece (Duel , for piano and sound projection) which was supposed to be quite different, although the original idea was lost in the practicalities of working with live electronics. The first movement is essentially piano and tape, while the second is more responsive from the piano, but it was originally supposed to be a lot more two-way than that. Do you have examples of really successful “interactive” (live electronic) repertoire that come to mind? I suppose Larry Austin’s Accidents 2 (1992) is very successful. Fabulous piece, very interactive. You play the piano in a different way. But it’s not an area I went into too much. For me, one of the difficulties with interactive repertoire on tour is that so much can go wrong. Ideally, you need to go as a duo with your own technician / sound projectionist. Exactly. It’s dangerous. That was precisely why we started the duo with Steve Montague and invited composers to write something for the duo, so he would deal with the electronic equipment, and I would be the pianist. We’d rehearsed the pieces beforehand. This is really the solution. Do you have any thoughts on the future of piano with electronic sound, is it something that can continue, or is it a closed chapter for you? It’s very difficult to say. We appear to be in a regression at the moment, and the spirit of adventure is less experimental than twenty years ago. There seems to be mainly technical innovation in the pop / jazz world to me. 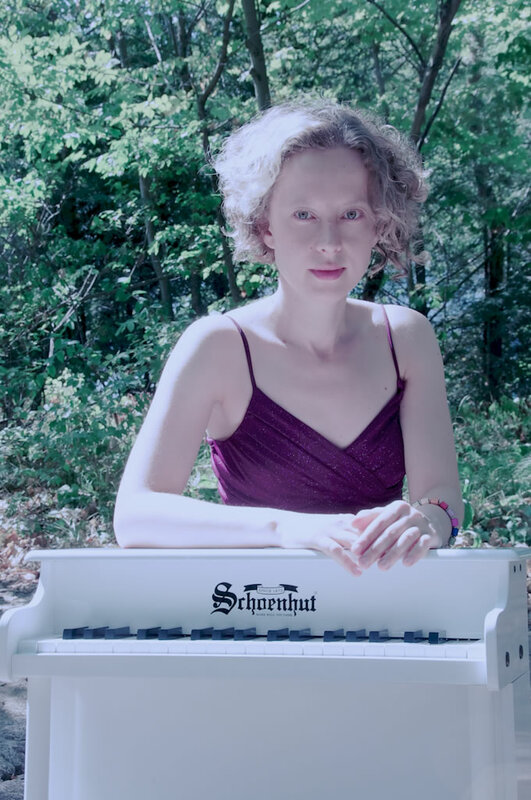 Xenia Pestova (New Zealand / Canada) is a pianist with a special interest in contemporary repertoire. She has performed with Stroma (New Zealand), the United Instruments of Lucilin (Luxembourg), ECM+ (Canada) and as soloist with the Luxembourg Philharmonic Orchestra. Among her awards are a unanimous First Prize at the XII Premio Xavier Montsalvatge International Piano Competition in Girona, Spain and a Special Mention at the Messiaen International Piano Competition in Paris. She often works with new media, and her recent release of Stockhausen’s Mantra for Naxos with pianist Pascal Meyer was praised by The Guardian (UK) as “a highly accomplished presentation of one of the landmark pieces in the second half of the 20th century.” Xenia is the head of performance at the Bangor University School of Music in North Wales.